Add your Business Views to Google Maps Street View! Just sign this agreement and have a check waiting for the photographer on shoot day. Wow! The best two values on the planet are Google Business Views & Youtube. Both hosted for free for years. Both rated # 1 for views online. Hello my name is Mark Holdridge of Market-Images.com. We handle nationwide & international accounts presence on Google Maps. 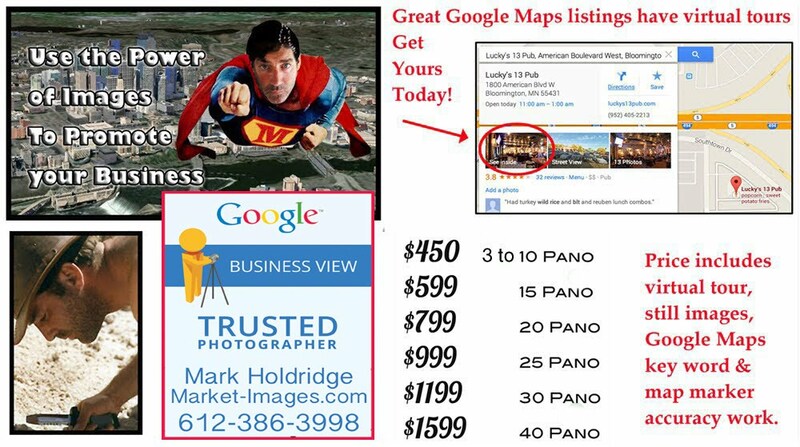 Google Certified Photographers & Producers of Google Business Views. Owner of Market Promotions since 1982, also historian, pilot & aerial photographer. Over one hundred virtual tours D'Amico.com's catering and restaurants. Enjoy this movie showing some of my creations. Read this 2005 international article on my tour of Costa Rica's SW Coast. See this 1992 historical movie or more on my historical business. Take advantage of the billions of dollars spent on the Google Maps platform every year. Pay a one time fee for years of coverage online!